This website has three parts. 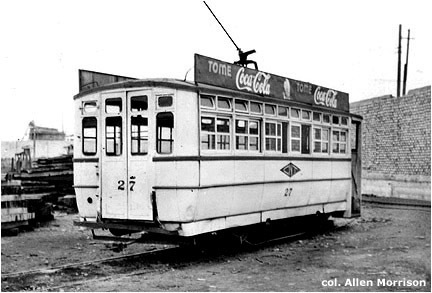 Lima experimented with battery-powered buses in 1905 [see Part 2], but its first permanent autobus service, with vehicles powered by gasoline, was not established until 1920. There were 160 buses on city streets by 1925, 400 buses in 1927. 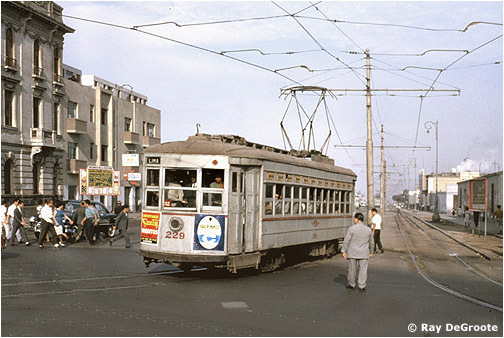 Buses brought serious competition for the trams and Lima Light, Power & Tramways Company (Empresas Eléctricas Asociadas) closed five of its eight urban tram routes in 1928. After that date, rail operation in the central area continued only on the two lines that crossed the river and on the east-west route from Plaza 2 de Mayo to Cinco Esquinas [see map]. 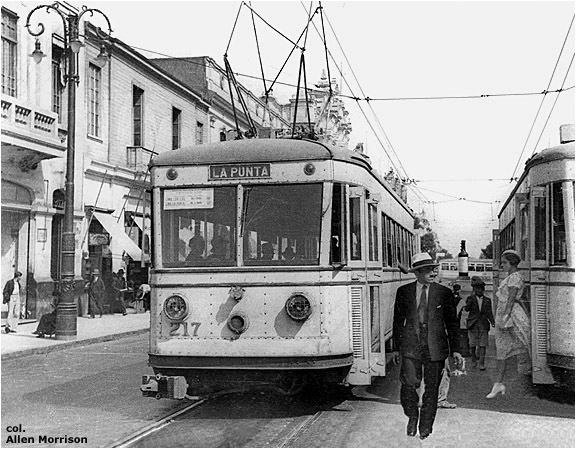 Likewise, beginning in the 1930s, the trams that provided local transportation in Callao, between Bellavista and La Punta [see map], carried bow collectors (liras in Lima). 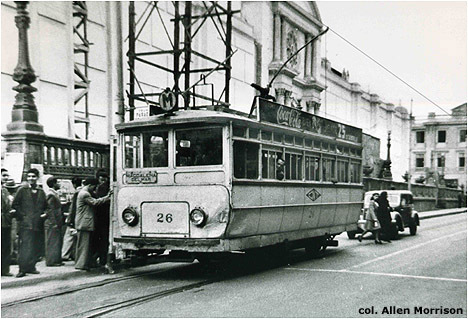 In other words, during their final 35 years of operation Lima trams carried liras in Callao, pantógrafos between Callao and Lima, and troles on the rest of the system. No other tram system in the world had an arrangement like that. During the 1930s CNT closed its Miraflores local line and the extension from Chorrillos through the tunnel to La Herradura beach [see map]. 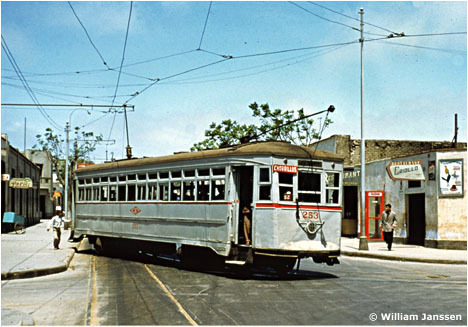 Lima Railways closed its electrified freight lines: the Chorrillos railway in 1933 and the Callao line - Peru's first railroad, inaugurated in 1851 - in 1938. 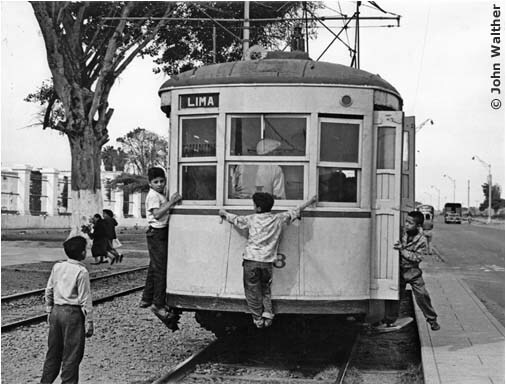 Otherwise, Lima's rail system seems to have remained unchanged during the next two decades. 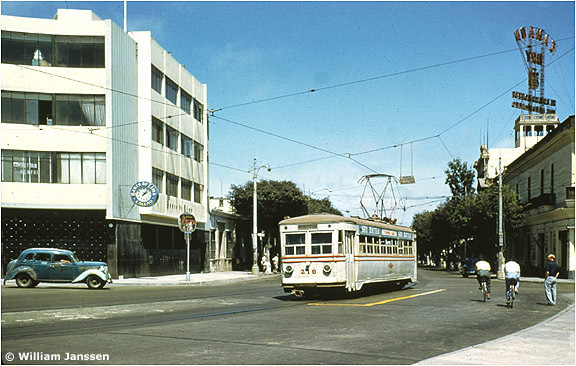 Trams provided only 15% of the city's public transportation in the 1960s and by 1965 there were only 24 cars - out of a former 150 - in operable condition. Revenue was meager and after 15 August of that year the CNT could no longer pay its employees. 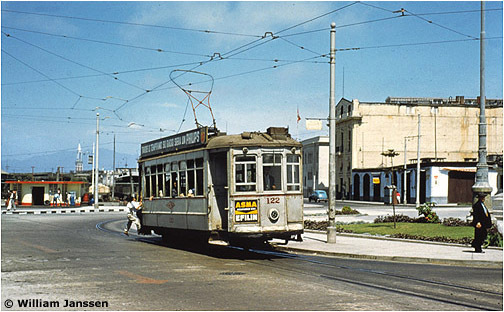 A thousand tramway workers struck the system at 6 am on Saturday 18 September 1965 and the trams never ran again. 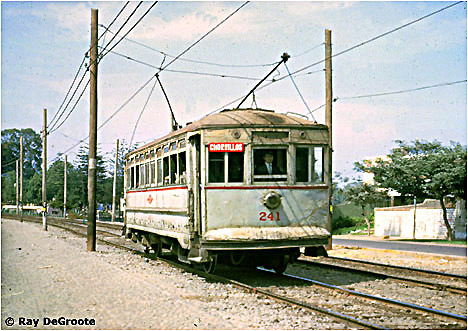 Efforts to restore service continued for a month, but on 19 October 1965 CNT officially declared the tramway system closed. Construction began two decades later of a metro line along a north-south course parallel to, and several kilometers east of, the former Chorrillos rail lines. 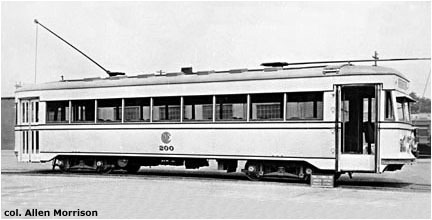 Five 6-car trains were ordered from Ernesto Breda in Italy - which had built trams for Lima 60 years before. The "Tren Eléctrico" was tested in 1990, but revenue service along the outer 10 km of the line did not begin until 2003. The inner 10 km of the route have yet to be built. 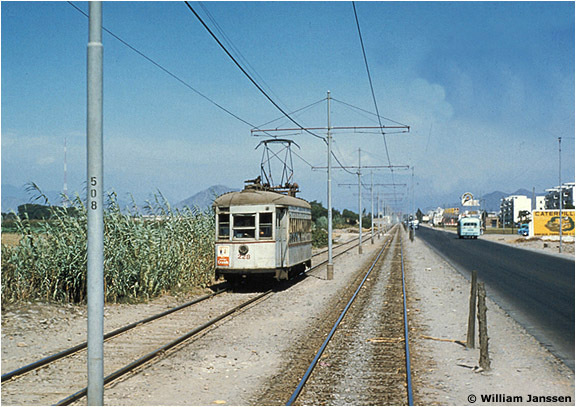 Part of the Chorrillos tramway opened in 1997! As on the other pages of this website, the author wishes to express his gratitude to Lima resident Elio Galessio for his invaluable assistance in the preparation of this survey. He also thanks Robert Stillman of the United States for the detailed track map that he drew of the Lima tramway system after a visit in 1963. "The Spread of the Trolley Bus: English Vehicles for Peru" in Electric Railway and Tramway Journal (London), 10/2/1928, pp. 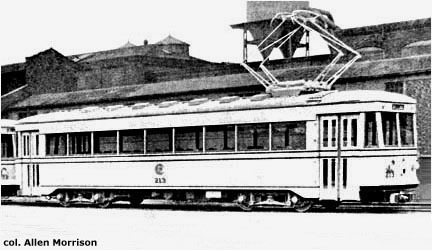 90-92; "Trolley Buses for Lima", 9/3/1928, p. 148. Two articles. Two photographs. "Trolley Omnibuses for Peru" in Tramway & Railway World (London), 16/2/1928, pp. 73-74. Detailed article, two photos. Santiago Antúnez de Mayolo. La Génesis de los Servicios Eléctricos de Lima. Lima, 1929. Fine general survey of electric transport in Lima. 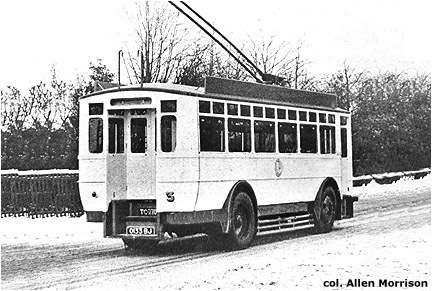 Brief description of the "línea de trollebuses" on p. 33. "Lima, Light & Power Company (Empresas Eléctricas Asociadas)" in Moody's Manual of Investments (New York), 1937, p. 898. Financial history of the system. "Trolley Buses Throughout the World" in Transit Journal (New York), 3/1939, pp. 82, 83 & 112. 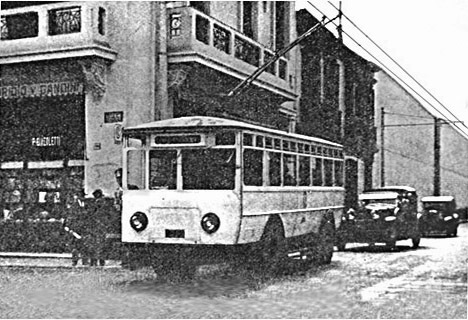 Source of the trolleybus picture on this webpage - the only known view of a trolleybus running in Lima. "From Broadway to Calle Lampa" in Grace Log (New York), 3-4/1947, p. 22. Transfer of New York trams to Peru. Four photographs. Allen H. Berner. 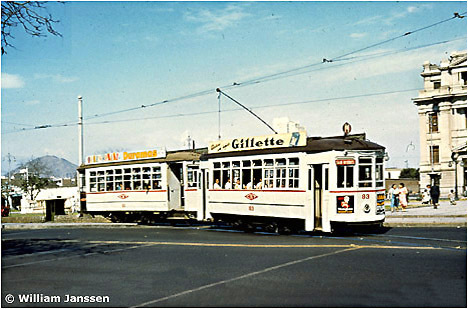 "The Trolleys and Lines of Lima, Peru" in National Railway Historical Society Bulletin (Philadelphia), Third Quarter 1958, pp. 8-11. Brief survey, seven photos. W. E. Hall. 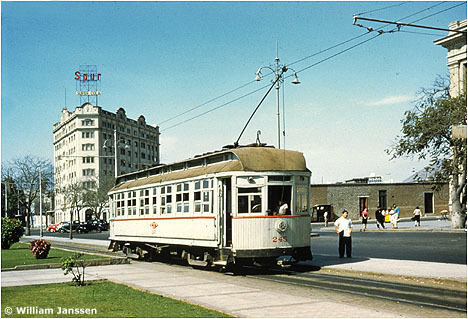 "Trolley Lines of Lima, Peru" in Headlights (Hoboken), 8/1959, p. 11. Short description, eight photos. Alberto Regal. 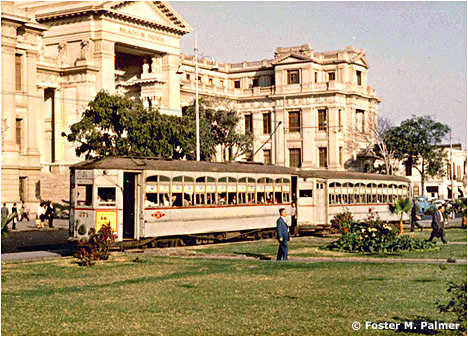 Historia de los Ferrocarriles de Lima. 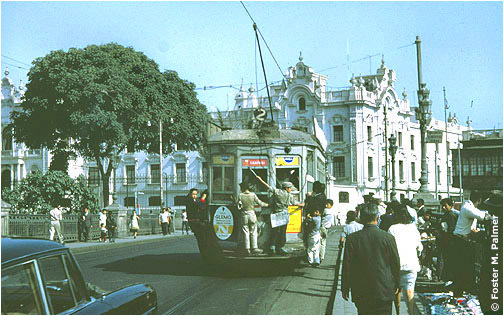 Lima, 1965. A monumental work. 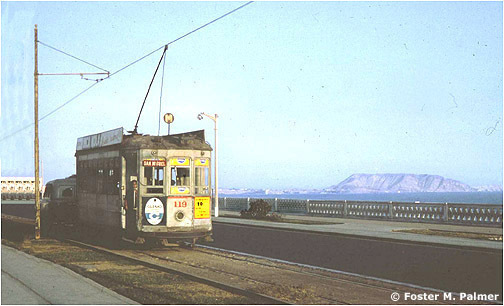 History and description of all the railways and tramways in the Lima area, including the Callao local lines (chapter V); Lima local lines (IX); Lima-Chorrillos lines (X); Lima-Callao line (XI); Lima-Magdalena lines (VIII). Numerous photographs and excellent maps. "Tranviarios inician paro" in El Comercio (Lima), 19/9/1965, p. 1. Unpaid tramway employees strike the rail system. "Tranvías vendidos como chatarra no cubrirían deuda al personal" in El Comercio (Lima), 4/10/1965, p. 5. Long description of the CNT problem. "Los Tranvías" in El Comercio (Lima), 11/10/1965, p. 2. "No volverán a circular más los tranvías en Lima" in El Comercio (Lima), 20/10/1965, p. 1. Official announcement that the tramway system is closed. 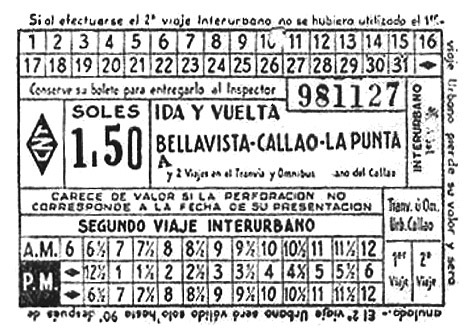 "Despedida al Tranvía" in El Comercio (Lima), 22/10/1965, p. 2. 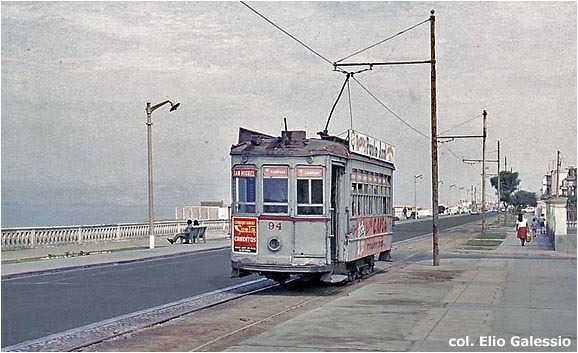 Long editorial: farewell to the tram. "Tranvías no Volverán a Circular en Lima" in La Prensa (Lima), 22/10/1965, p. 1. Front page feature article. "Tranvías: Condenados a Muerte" in La Prensa (Lima), 23/10/1965, p. 10. Trams condemned to death. Trevor Stephenson. "Lima's Forgotten Trams" in Lima Times (Lima), 25/11/1983, pp. 6-8. First of several illustrated articles which the author will recycle in the book cited below.